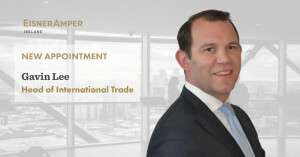 We are delighted to announce the appointment of Gavin Lee as Head of International Trade in EisnerAmper Ireland. As Head of International Trade, Gavin’s role is to work closely with our EisnerAmper Global colleagues to help our clients “Make Trade Happen”. Leveraging his first-hand experience of developing and conducting business in more than 40 countries worldwide, with specialist EMEA market knowledge, Gavin will help companies do business in Europe using Ireland as a base. Gavin brings with him 20+ years senior management experience in the financial services, telecommunications and life sciences sectors. Prior to joining EisnerAmper Ireland, Gavin worked with Digicel, Davy, Bimeda and Forte Healthcare, most recently as Country Manager. Helping companies do business in Ireland and Europe is what we do every day – audit, tax, advisory, risk & regulatory and outsourcing. In this regard, if we can assist you or your business in any way, please contact Gavin Lee.